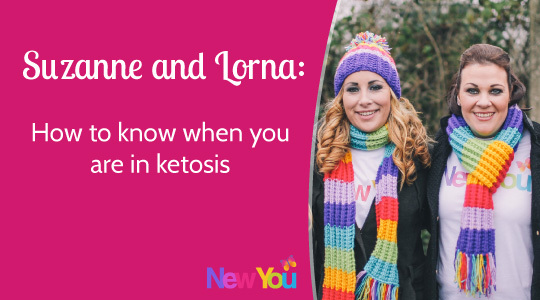 Lorna and Suzanne talk about how to know when you are in ketosis! I have covered this in a few of my blogs now, but just in case you are picking up from this point I felt it best to explain this principle. This is quite simply that the body usually uses food as its primary source of energy. Ketosis is the state in which your body uses its fat as its main source of energy. This happens when the body initially uses up its energy reserves of glycogen. This is a process that normally takes 3 to 4 days. When the glycogen stores are used up, the body then switches its main energy source to body fat. When fat is burned rapidly the body produces something called ketones and the person is said to be in ketosis. 5) You will not be hungry! – which is awesome given that you are on a diet! 8) You can buy ketostix that test the level of ketones in your urine. Take the time to read the instructions as understanding the readings on these can be frustrating (you do not have to be in a dark shade to be in ketosis). As I am sure you will agree from these points that ketosis an extremely desirable state to be in and is so easily achievable with The New You Plans TFR products. A month on the plan and I experienced none of the signs you mention. Does this mean that I haven’t been in ketosis? Today I have ordered ketostix as I’m starting back after a break while on holiday. My husband has just started along with me and likes to know exactly what’s happening so having a stick will encourage him.